A game that will go down in history, that is how the French press sees their matchup against neighboring Belgium in the semi-finals tomorrow, and thus all known comic book figures are being called in to help. Needless to say the French media talks about one thing only for the next two days: France-Belgium. The renowned French sports newspaper L'Equipe used a cover of a famous TinTin album (mission to the moon) in order to highlight the match, where you can see the coach and the most famous players of France en route to a rocket to the moon, being awaited by the most famous Belgian players. Tintin and captain Haddock have been replaced by the French national team coach Mr Didier Deschamps, striker Olivier Giroud and the chairman of the French football association Mr Noël Le Graët. Those three drive to the rocket where Belgian goalkeeper Thibaut Courtois, midfielder Kevin De Bruyne and striker Romelu Lukaku are waiting for them. L’Equipe stated that in order "to reach the finals of the World Cup, the French have to compete against their Belgian neighbors for the derby of the century." 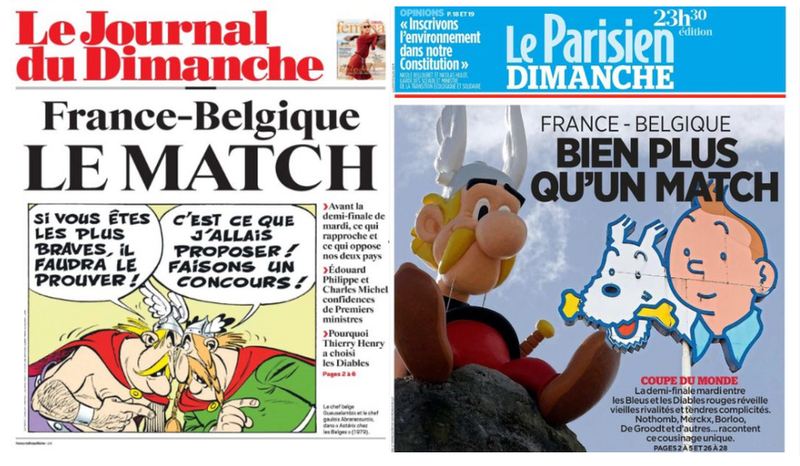 Meanwhile, Le Journal du Dimanche and Le Parisien both used cartoon and comic book character 'Asterix and Obelix'. In one of their albums, entitled ‘Asterix at the Belgians", the French leader of Asterix’s village organizes a contest to decide who is the braves of them all, the Belgians or the French after Roman leader Julius Caesar had stated that the Belgians were. The text says: “If you really are the bravest, then you must prove it! ", to which the Belgian village leader replies: "That's just what I wanted to propose! Let's keep a contest! "